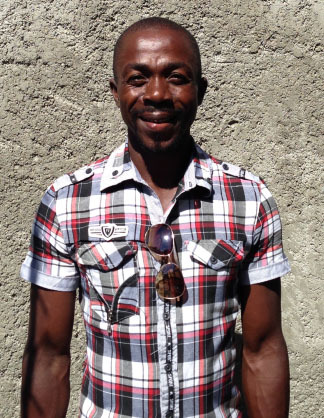 UPDATE: We are proud to announce that Noncent Arnold joined the Build Change staff in May 2014! Originally from Les Cayes, Noncent Arnold moved to Port-au-Prince after working for 15 years on his family’s farm in Léogâne. He began as a laborer and worked his way up to masonry. Mr. Arnold participated in six Cordaid-funded owner-driven housing projects that received technical assistance from Build Change in Tisous, Carrefour in 2012. He is now participating in J/P HRO and Build Change’s current owner-driven retrofitting project in Delmas 32. Build Change: Has your experience with Build Change helped you get any work outside of Cordaid or J/P HRO-funded projects? Noncent Arnold: Yes. A lot of other homeowners have called me because they have seen the good quality houses I’ve finished. I’ve been retrofitting homes now, too, and have completed four retrofits so far. In Tisous, I kept finding work long after Cordaid and Build Change had completed their programs. I also have sites in Gressier and Vivi Michel. Build Change: Are the techniques that you use in these projects any different from the ones you used before you worked with Build Change? Noncent Arnold: Yes. We never used to worry about following construction codes; nobody really cared. Now I make sure we always do. On a site in Vivi Michel, I had an argument with the mason I had hired to do the steelwork, because he wouldn’t rotate the stirrups correctly. I stopped and showed him how to do it well. These days, I always do the first set of stirrups myself to make sure they’re done correctly from the start. Build Change: Is it difficult to implement the techniques that Build Change recommends? Noncent Arnold: Generally no, but I used to struggle with placing hurricane straps because I’d never done it before. I still find it difficult sometimes because a lot of houses I retrofit aren’t square so it takes quite a bit of planning to get them in the right place. Build Change: What are the things you like and what are the things you don’t like about working with Build Change and J/P HRO? Noncent Arnold: I really like the projects because we end up making beautiful houses. I wish that I didn’t have to spend so much time away from home. Build Change: You have a big family? Noncent Arnold: I’m not married but I have 4 kids. The oldest is a 17 year old boy and the youngest is a 13 year old girl. Build Change: Is your oldest son a builder like you? Noncent Arnold: I used to want him to work with me but he prefers to play the guitar. He says he’s going to be a great musician. Build Change: Do you think he will be? Noncent Arnold recently completed Charlotte Jean Baptiste’s home, which houses four families (11 people total).